UPDATE: these graphs are already outdated, I have to see what Eurostat can give in terms of newer data. A year is a long time in economies! And maybe in particular the stuff about the housing bubble is not accurate – I have a newer post about that here. Something slightly different this time. 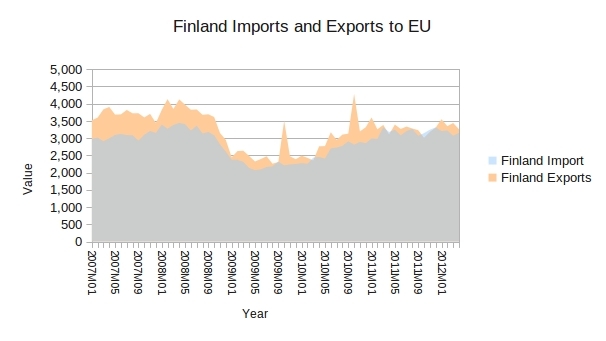 In a reaction to this news, which says that Finnish exports suffer from the eurocrisis, I would like to present some data (all from Eurostat) on how Finland has fared since around 2007. The idea came from posts like this one by Edward Hugh, most recently about Slovenia. I haven’t managed to get completely similar data graphs, but these will do. First of all, Finland is one of the few Eurocountries left with a triple-A status, which apparently gives it some clout regarding its wished in the ongoing resolution of the crisis (recall the demands for collateral on Greece, now repeated for Spain?). The triple-A status derives ostensibly from Finland’s low government debt, which is show below since 2007. 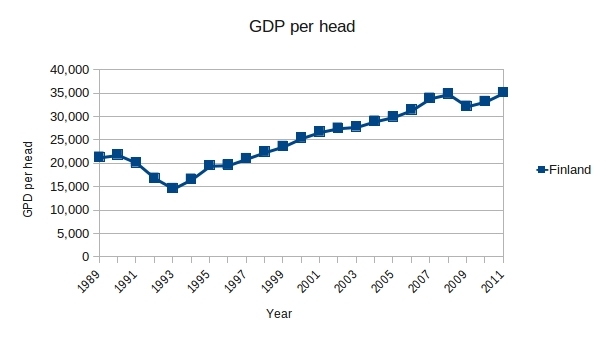 Although it is still much lower than Germany’s level, it is creeping upwards. But Finland is clearly one of the ‘good boys’. 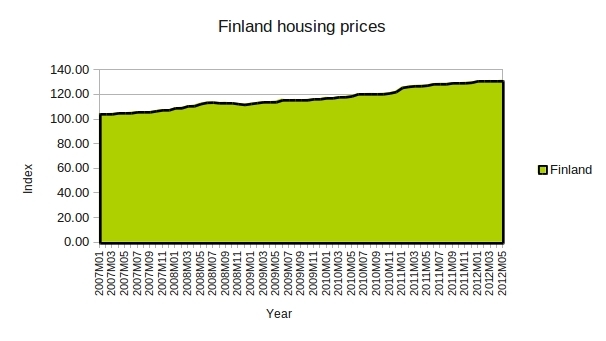 Does the low interest rate of the ECB fuel a housing bubble in Finland? It does not appear to be so, at least for the aggregate, it is nonetheless a slowly upwards trend which has its own problems. But there might be a distinction between the capital area around Helsinki and the rest of Finland. I will try to figure that out using Eurostat data. 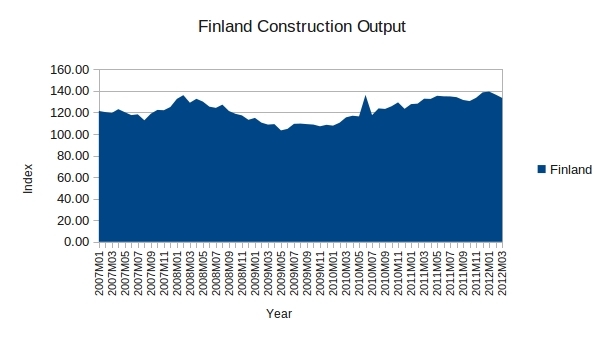 Also construction output is remarkably stable, not much affected by the eurocrisis. or showing signs of a bubble. One reason for this might be the pull of the Helsinki area, where there is a shortage of affordable housing. 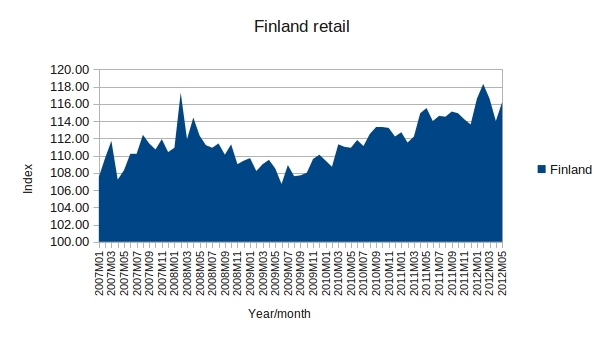 But the low rates of the ECB may seem to lead to increasing inflation in Finland. This is in itself not so surprising at this moment, but it is part of the explanation of Finnish reluctance to go ‘all-in’ regarding interest rates, because these would lead to increasing inflationary pressure. A more detailed investigation of the various components of Eurostat’s inflation indicator will give a hint of the sources for the inflation, but I expect that these are mostly related to imported products (but that is an educated guess, will follow up). As can be seen, this is a long term trend, although the crisis from 2007 onwards may have worsened this position. In a different graph, exports and imports to the EU show nonetheless that the balance is more positive, but barely so. 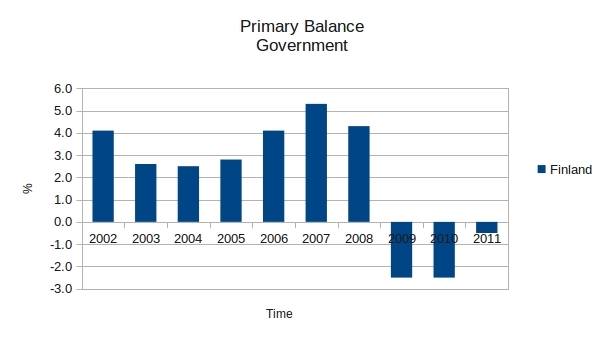 Finally, the primary balance of government budget shows that things have been slightly bad, but with the current government’s focus on getting the budget balanced, the budget deficit will probably soon disappear. 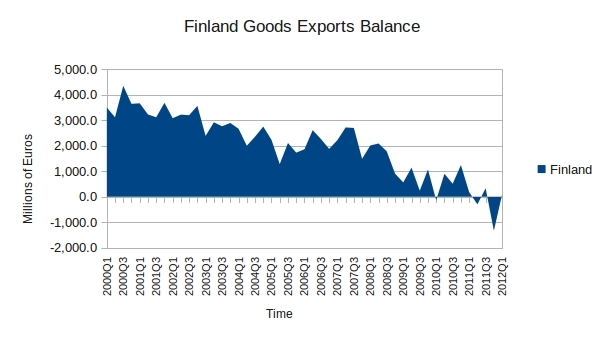 All in all, this is a very quick and dirty post about the current status of the Finnish economy- There are two things in particular that are worrying: inflation and the trade balance. The first has to do with the interest rate set by the ECB at a very low level, and the second with (presumably) declining demand in especially Germany and the rest of the world. Considering retail, domestic demand seems to be holding up quite well. At least after the worst of the initial economic crisis, retail has recovered to its 2007 peak. Many aspects of the economy are left outside this post, especially concerning unemployment and various export sectors, but the Finnish economy seems to be doing quite well still. It remains to be seen what happens to inflation and the balance of trade, though. For a small export-oriented economy it is not a good development that it might be importing more than it is exporting. Two things do stand out however: the financial crisis in the early 1990s was indeed very severe and not unlike the present one (a lot could be learned from how Finland and Sweden dealt with their banking crises). Second, although the path of growth has been resumed it nonetheless looks like the Finnish economy is performing under its full potential (if we’d extrapolate the trend from pre-2007, it is clear the current growth track is at a lower level). But not bad at all. Unemployment then. Finland has a union-managed system of unemployment funds, which means there is a large incentive to belong to a union (you get up to 500 days of a certain percentage of your last salary, more or less). This does not affect the level of unemployment, but it does reduces the human suffering. As can be seen, in the early 1990s the unemployment rate reached very high levels, not unlike what is seen in Spain or Greece (although those are worse in the present time). 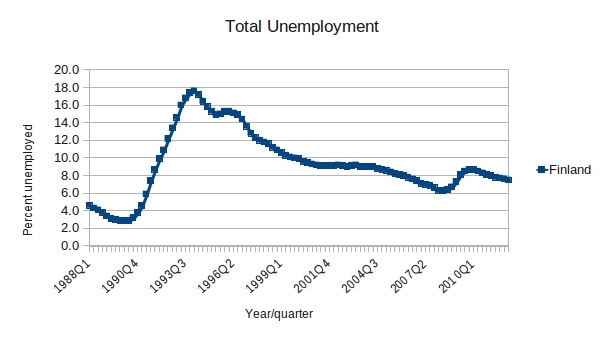 But although the unemployment rate has dropped since then, it is still quite high and seems to have stabilized around 7-8 %. Furthermore, the present crisis has again sent the rate upwards, at least temporarily. Behind this relatively high unemployment rate lies a complex story of economic restructuring which has to be told elsewhere, but basically it is from manufacturing to high-tech services (think Nokia, F-Secure). This has led to a large proportion of long-term unemployed, that is unable to find work since their jobs don’t exist anymore. 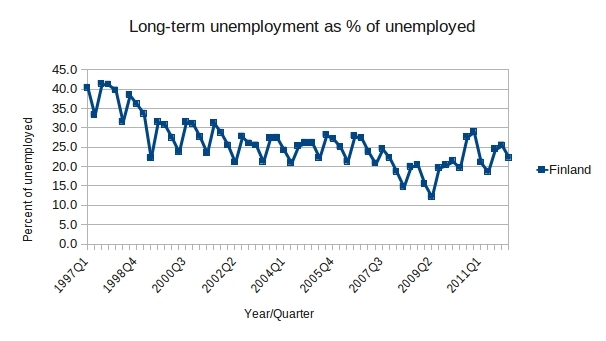 This graph, which also shows the seasonal variation, shows that in Finland, even nowadays some 20% of unemployment is long-term unemployment. This is a potential problem in terms of the welfare-state but also politically, because these people are not so likely to have confidence in the current political parties, which, after all, haven’t managed to create policies that get them back to work. This entry was posted in A Fistful of Euros, Eurocrisis, Finland, Trade Issues and tagged Balance of Trade, ECB, Eurocrisis, Finland, Inflation, Macroeconomics. Bookmark the permalink.